COMC is a BGS Authorized Submission Center. This allows you to send cards directly from your inventory off to Beckett to be graded, whether the cards were purchased through our site, transferred to your account, or consigned directly to us. Your COMC account will be charged $12 plus 1% of the value you declare for the card to cover insurance. There is an additional $8 charge if the card is oversized and a $2 charge to grade a card with an authenticated autograph. This grading fee is charged at the time you finalize submitting the card for grading. The card will be temporary removed from the site in order to be mailed to BGS for grading. We send cards in for grading twice a month, and it typically takes about seven weeks for the cards to be added back to your inventory. 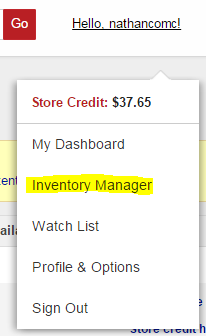 Next, use the highlighted area to search your inventory for the card you desire to be graded. You can search by player name, set, year, manufacturer, and/or card number. 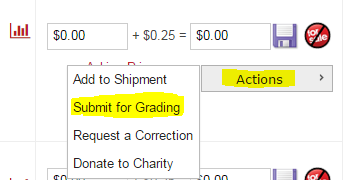 Once you have found the card to be graded, use the action menu to the right of the card to select Submit for Grading. The next page will allow you to choose the Beckett Grading Service. You will then see the page that allows you to specify the declared value for the card. We send a shipment of cards for BGS grading twice a month. 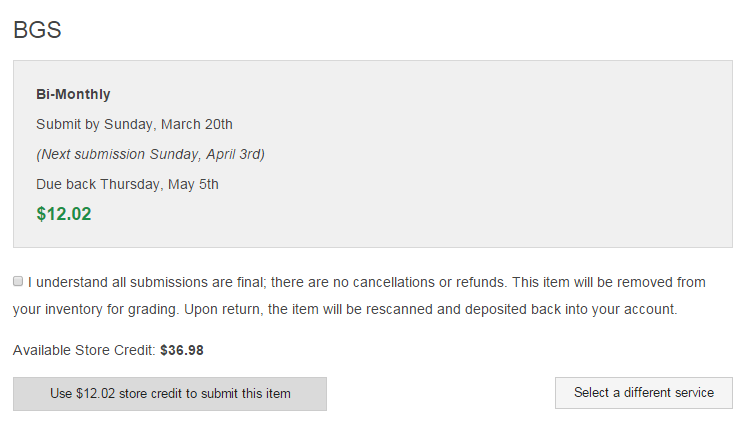 In this example, if the submission was made before Sunday, March 20th, it would be due back in your account by Thursday, May 5th.